As much as no artist wants to let anything stop them, Hurricane Harvey has cast its ragged arms over my studio life this month, affecting everything from what I can eat, to my ability to charge my iPad or access the internet. Marc and I are doing okay. Our reality within the hurricane necessitated purchasing granola bars and water last week for the inevitable stretches of time where we would not be able to go to the grocery store. I've filled up our bathtub in the case of losing water, or losing clean water. Thunder wakes me up constantly each night. We've lost internet. A curfew was installed, and we stood in line for food while some people openly looted a gas station. The mail hasn't arrived for five days and it probably won't arrive for several more. From what we've heard, we are in for a few more weeks of low supplies, rain, and roads that are just gone. Natural disasters acknowledged, this month I have been working on making the environments of my comic look like people actually live in them, taking all of the small facts of life into consideration. Who lives here? What do the plants look like? Where do they get energy from? How do they do their laundry? How would they paint their house? All of these little questions help me build environments like the one above. Although the questions sound a bit obvious, it's always taken extra effort for me to pay attention to details. I am the kind of person who easily identifies large-scale patterns, allegorical themes, and deep messages, but I don't see pebbles on the ground very easily. I'm trying to see the pebbles on the ground. Overall with the comic I can't wait until I start drawing Part 2 - Part 1 seems like it will end up being about 50 pages. Anyone who says that the beginning is the hardest part is not lying. In other art news, I took advantage of early August's searing heat to rapidly create handmade paper. Last year one of my artist friends, Rejin Leys, was kind enough to mail me a paper-making deckle, which I use combined with loose screening to make sheets of paper. 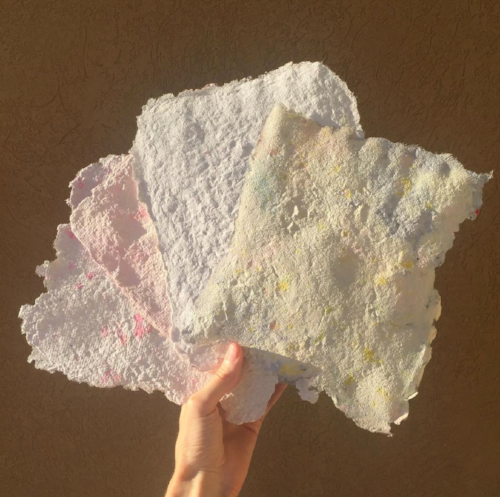 Papermaking is my response to the paper that businesses mail me constantly - I rip up advertisements, insurance offers, and pamplets, throw them into a blender, whip them into a pulp, then lay them out to dry. If the world keeps bombarding us with paper, why not just make it into a thing of beauty? Despite the humidity in Houston, each sheet dries out in about 8 hours in the sun. I'm not sure what I will do with the paper yet, but it is fun and satisfying to make paper! I've also gone back and started working on figure studies again. The point in my life where I was probably best at drawing figures was in school, but, I'm slowly recouping the eye/hand power I used to have. When I forget what was really there, I just add colors and and shapes until it seems to be kind of close to not the thing itself, but the memory of the thing and how much fun it was, or how much I loved it. Working with memory, I also made this image of my husband Marc writing code in Emacs while our poodle Geddy looks on. I couldn't really remember exactly what the Emacs interface looked like, and sometimes Marc changes it up a bit. I remember there is a Nyan cat is on the bottom left, and that all of the code he writes is usually any mix of gray, orange, blue, purple, and green. When I showed Marc the drawing, he wanted me to add DogeMacs to the screen, so I added it (the only part not from memory! I had to look at Dogemacs as a reference to get it right). 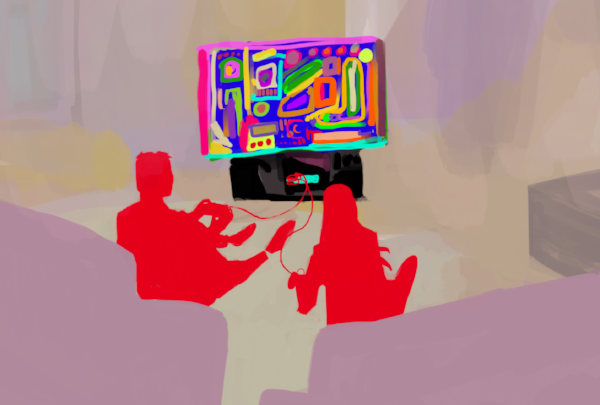 With my constant switching between real/unreal, sometimes I worry that my work won't ultimately won't be stylistically cohesive, or it won't look like it was all done by the same person. I abolish this worry by remembering that people are too used to seeing art from the same artist conform to a a consistent look. Music and visual art are similar this way. When an artist makes stylistic quantum leaps, they are trusting their audience to believe in the multitudes that a person can contain. We will see how this turns out. Wish us luck as we continue to endure Hurricane Harvey. Harvey is not over. Harvey is our living reality.